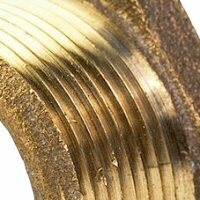 Air Brake Brass Male Run Tee - Maintenance Products Inc.
Hi-Flow air brake brass male run tee fittings are used in conjuction with reinforced nylon air brake tubing NT100 - SAE J844 Type A and B. Typical application: air brake systems except where temperatures exceed +200 degrees Fahrenheit or where battery acid can drip on tubing. Pressure and vibration: maximum operating pressure of 150 psi and fair resistance to vibration. The minimum burst pressure of airbrake tubing is 1,200 psi. Conformance: Meets SAE 100102ba and DOT FMVSS 571.106 specifications.